Imogen Polytunnel full of tomato vines. The first few Sungold of 2017. Green tomatoes on the vine. Lena, from Germany, left the farm yesterday after three weeks with us, and we'd also like to thank her for her help. Lena planting onions, with Martin, Andy and Rob spreading compost in the background. Back row from the left - Stijn, Lena, Rob, Hugh, Rafa. Middle - Dylan. Front row from the left - Tasha, Luise, Yizu. 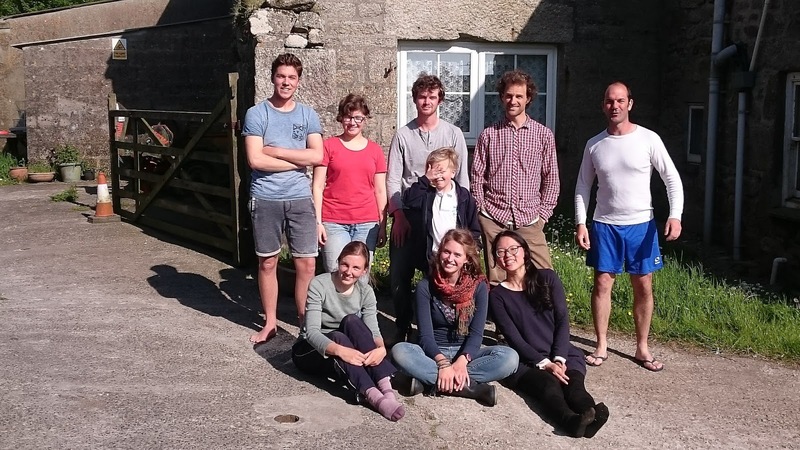 We'd like to thank three of our wonderful wwoof volunteers who came to the ends of their stays over the past few days, all of whom are in the above photo taken by Rafa. Yizu, from Taiwan, after her first visit; Rafa, from Tenerife, after his second visit; and Rob, from England, after his third visit. Small box - potatoes, rainbow chard, mixed salad leaves, organic courgettes from Crowlas, and organic spring greens from Cargease. Price £6, or £7 delivered to your door. Standard box - potatoes, rainbow chard, mixed salad leaves, purple kohl rabi, strawberries, rhubarb, mixed herbs, organic courgettes from Crowlas, and organic spring greens from Cargease. Price £10, or £11 delivered to your door. Boxes can also be collected from Bosavern Community Farm (St. Just), North Inn (Pendeen), and CafeArt (St. Ives). Vicky's organic bread (Helston), and organic Guernsey milk (Treen) can also be included in your box. Our bee-friendly-garden and bee-education-shed, developed in conjunction with Grow Wild and Kew Gardens, have recently come on in leaps and bounds. Most importantly, the observation hive inside the shed has been populated with Cornish black bees, who are now flying in and out of the back of the shed foraging for nectar across the farm and surrounding area. Inside the bee education shed. Cowslip blooming in the bee garden. Planting the tiered herb hexagon. The shed's living roof planted with a range of wildflowers. Lena, Bodhi, Joan and Ben working in the bee garden. Teesh and Martin laying substrate for the liviung roof. Willow and Ian planting the rockery. Roman, from Switzerland, has camped and wwoofed at the farm for the past two weeks, but left yesterday to continue his journey around Penwith. Roman can be seen in the photos of onion planting a few days ago. Thank you Roman for your help and enthusiasm! Small £6 veg box - potatoes, rainbow chard, rhubarb, salad leaves, and spring greens. Standard £10 veg box - potatoes, rainbow chard, salad leaves, spring greens, mixed herbs, purple kohl rabi, globe artichoke, lettuce, and a cauliflower. Please contact us on 788454 or vegbox.bcf@bcents.org to inquire about or order a veg box. Sarah, from Germany, left the farm on Friday after three weeks wwoofing with us. Many thanks to Sarah from everyone at the farm, and we all wish you well back home. Sarah planting Witkiem broad beans in the market garden. After planting onion sets for the past 7 years, with varying results, this year we decided to grow some onions ourselves from seed (Bedfordshire Champion), and buy some transplants from Tamar Organics (Bajosta and Rebloja), and plant all live seedlings instead. After planting one and a half lines of our own onions on Tuesday (along with two kinds of kale, two of cabbage, some spring onions and red chard), yesterday we got a team of volunteers together and planted over 3000 transplants by hand into lines of compost on the Market Garden, filling another eight and a half lines. At least the sun came out to dry us off, and we even had time left at the end of the afternoon to clean the chicken sheds out. Thanks to everyone! Rob, Tasha and Martin planting onion transplants. Lena planting onions, with Martin, Andy and Rob putting compost on the rows. Roman and Tasha planting onions into finger-dibbed holes. Onions all planted and covered in mesh to keep the rabbits and birds off. Martin, from Germany, has left the community farm today to go and travel around the UK, after volunteering with us for more than two months. Many many thanks go to Martin for all his invaluable help during that time. Martin returning from the chickens with a barrow full of eggs. Sugar-snap and mange-tout peas (polytunnel). Mixed herbs (outside and polytunnels) - chives, parsley, oregano, fennel, coriander. Mixed salad leaves (outside and polytunnels). On Wednesday 10th May we brought a new flock of 120 Colombian Black-tails to fill our third chicken shed, so that we now have just over 340 laying hens on the farm, with a one hectare field all to themselves. As yet our new birds have not started laying eggs, but they will do soon, and then we will have plenty of eggs available for the busy summer months. Small veg box (£6), shown here with one dozen free-range eggs (£3.20), a large sourdough loaf from Vicky's (£3.10) and a litre of Treen milk (£1.25) - potatoes, chard, mixed herbs, mixed salad leaves, spring greens, and 2 dried chillies (£13.55 in total, or £14.55 delivered to your door). Standard veg box (£10), shown here with half a dozen eggs (£1.60), a small spelt loaf (£1.80) and a litre of milk (£1.25) - potatoes, chard, mixed herbs, spring greens, rhubarb, purple kohl rabi, mixed salad leaves, a cauliflower, and 2 dried chillies (£14.65 in total, or £15.65 delivered to your door). April has been a busy month in the polytunnels, and now, early in May, we have got all our summer crops planted into our five polytunnels, with the last of the cucumbers going into the ground today. Three lines of long black aubergines planted between two lines of sugar-snap and mange-tout peas, in the Sausage. Half of our cucumbers planted amongst the herbs and strawberries of the Mothership. Our first crop of strawberries from the Mothership (6th May). Tomatillos planted in the Mothership. Several varieties of peppers planted alongside our leek seedbed (plus chard, kohl rabi, and French beans) in Valentine. Ring-o-fire chillies and jalapeno peppers planted in the Mothership (with Vietnamese coriander at the back). French beans climbing up mesh in Valentine. Our fourth polytunnel, Nigel, is now full of summer salads, and our fifth, Imogen, is full of tomatoes. We are now turning our attention to the outdoor market garden, where we planted broad beans last week, globe artichokes at the weekend, and chard today, and we have kale, summer cabbages and peas to go in later this week. Busy! In April the community farm hosted the second of a new series of seasonal landscape painting workshops, facilitated by a local artist and organised by one of our regular farm volunteers. Seven people attended the workshop, and could be seen scattered about the farm painting whatever took their fancy. The next workshop will be in July: for more information please contact us and ask for Sonja's contact details. ...and in the market garden. Jin, from Korea, seen here sowing runner beans into modules, volunteered on the farm as a wwoofer for 3 weeks, and left last Friday. We would like to thank her for her help during her stay, and wish her all the best with her eco-project in Myanmar. Rob, seen here picking chard in the market garden, left the farm last week having volunteered as a wwoofer with us. Thank you Rob for your help during your stay, and we wish you all the best for the future. Our standard £10 veg box last Friday contained potatoes, chard, carrots, mixed herbs, spring greens, lettuce, mange-tout peas, rhubarb, and swede. Our small £6 veg box contained potatoes, chard, carrots, mixed herbs, salad leaves, and swede. That is now the end of our swedes and lettuces for the time being, as the annual "hungry gap" makes its presence felt again. Standard £10 veg box - potatoes, swedes, oriental greens, mixed herbs, lettuce, purple kohl rabi, carrots, and a white cabbage. Small £6 veg box - potatoes, swede, chard, white cabbage, carrots, and a lettuce. Veg boxes packed ready for delivery and collection. Our May Day event this year was held on 30th April, as is traditional for Beltane. About 100 people came to their community farm to celebrate the beginning of summer. Matt Pitt, of the Cornish Black Bee Company, showing Jill a mock-up of the demonstration hive in our new bee-education shed. Ian leading a tour of the developing bee garden. Ian leading a tour of the rest of the farm, outside the cob round-house. Julia painting faces in the farmyard. Our café for the day inside the cob round-house. Rosie and her pop-up food truck in the farmyard. Cutting into home-made cakes in the cob round-house café.